Heroes! The residents of Honor Hold and the surrounding outposts of Hellfire Peninsula are in dire need of your help! A creature under the name of the ‘Fel Reaver’ is running amok, and the citizens are darned tired of being squished! This foul creation must be taken down, one way or another. Bring me its head! Effraeti scanned the poster with mild disinterest as she was heading into Honor Hold’s inn. It was signed “Danath Trollbane” but in a hand different then the body of the announcement. For its length she also noticed, to further her lack of curiosity, there was no mention of a reward. As an undead, she had no need for sustenance or the usual creature comforts, but she still made use of them. Perhaps it was merely a carryover from when she did truly eat and sleep and breathe, or perhaps it helped her retain some feeling of belonging among the still-living. Either way, comforts required coin – such as this inn, the next leg of her seemingly aimless wandering. She could not recall how long she had been traveling. The countless inns, untrusting proprietors and wary patrons had all begun to meld together. But something had called her to the Outlands. The more she saw of the place, the more frequent and jumbled her memories became. The dried, red husk of a world, the swirling cosmos above seemingly within touching distance, even the creatures that roamed the wastelands – all of them reminded her of what Draenor once was. Back when she had breathed the clean air of this world, back when the world was green and the sky was blue, back when the animals were not corrupted by fel energies, back when demons did not outnumber the more peaceful inhabitants. Effraeti’s subconscious seemed to be pulling her in the direction of Shattrath. Effraeti ran restless fingers through her dark hair, tucking the pieces that would allow it behind light blue horns. The shorter pieces still brushed against her smooth, pale cheeks. She recalled that it used to tickle, when her blood still flowed. The thought made her close her eyes for a moment, but only for a moment, as closing them reminded her was she was glad to no longer needed sleep. Her jumbled memories came to her easily enough with her eyes open – with no outside images to keep them in check, they were almost overwhelming. Upon opening her eyes, Effraeti saw the serving girl standing before, eyeing her strangely. Annoyance flaring, Effraeti stared the serving girl down with her menacing blue orbs and a quiet snarl until the girl gasped, hastily set the mug down and hurried away. A smug satisfaction crossed the Death Knight’s pale countenance. With drink in hand, Effraeti settled herself in and listened to the local gossip. The poster regarding the Fel Reaver seemed accurate enough from the talk. Most of the conversation related to someone’s friend, brother, mother, falling victim to the behemoth. It did seem the creature was quite troublesome. Effraeti nursed her drink and caressed the wrapped handle of her runeblade, deep in thought by this point. The plight of the inhabitants of Hellfire Peninsula fled her mind, for the resurfacing memories that were a near constant plague to her thoughts were being more persistent than usual. Even this inn brought back flashes. She had been here before, though, it must have been during her time as an adventurer. This outpost had not existed at the time when she called Shattrath home. Effraeti blinked at that thought. It took her a moment to realize it was in fact correct, and likely the most profound thing she had recalled thus far. Shattrath called to her because it had once been her home – before she was a Death Knight, before the Draenei fled and crashed on Azeroth, before she was even an adventurer. These realizations made the memories come faster and with more intensity, until she felt she would choke. The inn’s common room suddenly felt stifling and small and Effraeti had to flee outside until she stumbled against the door frame out front, breathing heavily for reasons she could not grasp. Right there on the front side of the inn, her legs gave out and she sat heavily onto the red dirt ground, her hooved legs trembling beneath her. She could not recall ever feeling so out of control of herself, and Effraeti cursed in frustration and mentally willed herself to regain control. After what felt forever sitting there in the dirt, Effraeti stood. Her legs wobbled briefly and with another curse she chided them into obedience. Glancing around and noticing the odd looks she was getting from the guards patrolling Honor Hold, Effraeti decided it was time to go. She wanted no more attention brought to her than what already accompanied her undead disposition. She checked her runeblade’s security, harnessed on her back, and walked out the gates of Honor Hold without a backward glance. Once clear of the outpost, Effraeti summoned her mount, Sorrow. She patted the undead steed’s neck, receiving an echoy whicker in return. Effraeti had learned early on that the sight of Sorrow discomforted the living even moreso than herself and she had taken to calling him only outside of civilized settlements. Urging Sorrow on, Effraeti made to put distance between herself and Honor Hold. She could not see Shattrath yet, but she could see the tops of trees on the edge of Terrokar Forest, one of the few remaining lush places on the broken Draenor. Sorrow kept a good pace and Effraeti was left to her thoughts once more. Riding through Hellfire Peninsula brought back flashes as well. There was once a temple. Over there was a grove of trees. That spot had held a quiet pond where there had been the sounds of frogs and crickets on summer evenings. So deep in her thoughts was Effraeti that she almost missed the tremor that vibrated up Sorrow’s legs and rattled the small pebbles strewn across the hard-packed red dirt around them. Her mount stamped nervously as Effraeti brought him to a halt. Eyes widening, the Death Knight’s gaze fell upon something that unless she were blind she could not have possibly missed. It was an enormous construct bearing down on them with excruciatingly slow, long strides. No explanation of its size could have done the thing credit, it was taller than any building she had ever seen. Effraeti estimated one of its hands to be twice the size of both Sorrow and herself. No fear struck Effraeti, but the reality of the situation did. Commander Trollbane wanted this thing’s head? What did he expect, her to chop at its toe – if it had such – and watch it tumble over? The construct let out a mechanized roar and Effraeti knew she had been spotted. Mind racing, the Death Knight reviewed her options. Confrontation seemed inevitable, as despite how slow the creature’s steps were, they seemed to cover wheels at a time. Just in the short time between her noticing it, it noticing her and the following few breathes it was nearly upon her. Effraeti leaped from Sorrow’s back and drew her runeblade in one fluid motion, red clouds of dust puffing beneath her hooves. Then, she said a command to Sorrow and the creature reared, neighing, and disappeared into a greyish cloud of smoke. Her runeblade thrumming with anticipation, Effraeti took up a defensive stance and watched the Fel Reaver close in. Just before it reached her, the Death Knight called upon the fallen, seeking to bind them to her will with the necromantic powers bestowed her by the Lich King. A chorus of groans echoed around her, and creatures of decay and rot began to pull themselves from the very ground around her. Some were merely bones, but some still retained the tattered remnants of skin and sinew and clothing. Within moments a veritable army of the dead clustered around her, waiting only for her word. As the Fel Reaver rumbled mechanically again, Effraeti loosed her undead minions upon it. They looked more like ants attacking a wolf than full-sized humanoids against the giant construct. They were merely a distraction, though. Effraeti cared not for what happened to the undead she called, they would merely go back to their slumber of death when she was done with them. Instead, she focused on climbing the distracted creature like she might a stone tower. To assist, she plunged her runeblade through the construct’s metal plating, each time using it to hoist herself higher. The Fel Reaver swatted at her distractedly a few times, but seemed more focused on the assault at its feet. Finally, Effraeti reached the creature’s shoulders. She pulled herself up once more and stood, unsteady at first but quickly gaining her balance. Then, summoning the powers of cold and death, she released a bolt of ice with her hand while stabbing at the base of the creature’s head with her runeblade. Green, caustic plague-energies enveloped metal where the runeblade touched, and a growing patch of frost crept alongside it. A mechanical roar jarred her teeth within her head, and Effraeti had to grasp onto whatever was closest – something about where the construct’s ear might have been – and plunged her runeblade into the creature’s neck once more. This time self-preservation overcame the need to inflict harm, as the Death Knight scrambled for purchase. A large metal hand pawed around where Effraeti clung. Against her better judgement, Effraeti clung tighter with her hand and retracted her runeblade to stab at the seeking appendage. The magic of the blade sliced one of the metal fingers clean off at the second knuckle. 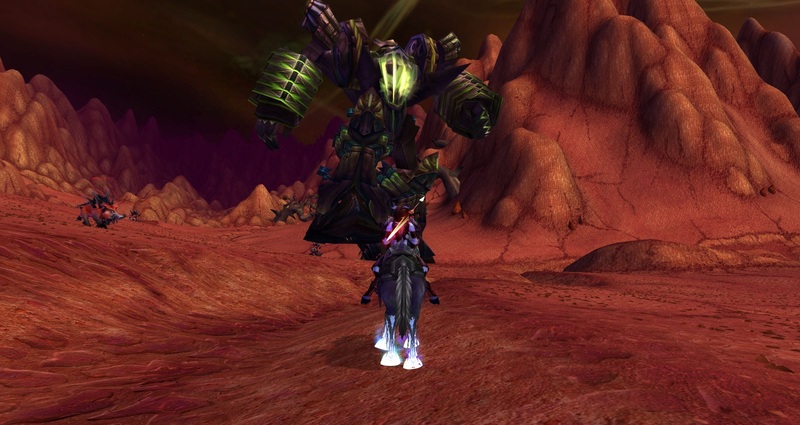 Roaring its mechanized disdain, the Fel Reaver retracted its hand and resumed stomping and grasping at the multitudes of ghouls and skeletons attacking from below. Effraeti wasted no time taking advantage of her chance at finishing the construct. She plunged her runeblade once more into the its neck, pulled herself back up, and swiped out in a wide arc. The sound of metal screeching against metal was horrific and teeth-clenching. Sparks flew as well as bolts and ragged chunks of fel iron. A great crack was forming between the c0nstruct’s head and shoulders. Effraeti made several more deft swipes of her runeblade while balancing her hooves precariously on the Fel Reaver’s shoulder. The metal and wiring stubbornly clung together, despite how frayed and sheared it was becoming. A quick glance below her made Effraeti realize she was running out of time. The Fel Reaver was quickly dispatching the few remaining undead at its feet. Another ice bolt flew from her hands, striking on the already damaged area, freezing it. One more heavy swipe of her runeblade on the brittle metal nearly severed the construct’s head. The Fel Reaver jerked to the side and Effraeti nearly went tumbling to her certain demise. Only a desperate stab of her runeblade deep into the construct’s shoulder saved her. She once more clamored up the creature, and let loose a fierce cry as she swung and fully decapitated the Fel Reaver. Another terrible shudder wracked the construct and this time Effraeti went tumbling off its side. Falling faster than the Fel Reaver, Effraeti quickly thought to use this to her advantage and sent out a smoky, claw-like tendril at the construct’s arm and with a jerk that nearly dislocated her shoulder Effraeti came to a stop just above the ground. She dismissed the tendril and dropped into a crouch. Then, noticing the Fel Reaver’s path of descent, the Death Knight dove to her right just as it crashed to the ground. The shockwave of the impact knocked her onto her back and jarred her temporarily immobile. Effraeti stood and readied her blade, waiting for the Fel Reaver to make a move. After several breaths of no movement from the construct, she pushed at its head with her runeblade a few times. With a nod, she made to turn away, but the Fel Reaver’s eyes flickered in its severed head and one last warbly, mechanical groan issued forth before the eyes went dark again. Despite all that had just occurred, Effraeti found herself looking in the dead eyes of the Fel Reaver and wondering how on Draenor she was expected to get the construct’s head back to Honor Hold. This story was originally published on Effraeti’s RP, on November 6, 2011. All rights reserved.